The Sustainability award recognises theatres or companies that have implemented significant environmental initiatives. Any theatre company or organisation working in the sector is eligible and it will be judged on supporting evidence. The judges will take scale into account and are expecting submissions from organisations large and small. At a time when sustainability is more deeply engrained in the collective consciousness than ever before, organisations such as environmental arts agency Julie’s Bicycle  have become increasingly important to the sectors in which they operate. Among recent major projects is the Accelerator Programme , which was launched in partnership with Arts Council England this year after more than a decade of collaboration between the two bodies. The programme runs for four years, until 2022, and recruits arts organisations across England that have already shown some commitment to sustainability but wish to further embed it into their work. Among the first cohort are Matthew Bourne’s New Adventures , Norwich Theatre Royal  and Sadler’s Wells , which will work together to develop “a new blueprint for environmentally sustainable touring”. Other projects include an incubator and resource network for the touring sector, and the development of new products made entirely from waste that have been generated at festivals run by Festival Republic (Reading and Leeds, Download) and Boomtown. While Julie’s Bicycle exists to bring about change around sustainability in the arts, and the Arts Council has also encouraged funded organisations to reduce their carbon footprint for several years, the Accelerator Programme is a large-scale, ambitious commitment to innovation in this area, and a creative approach to fostering collaboration across the sector. 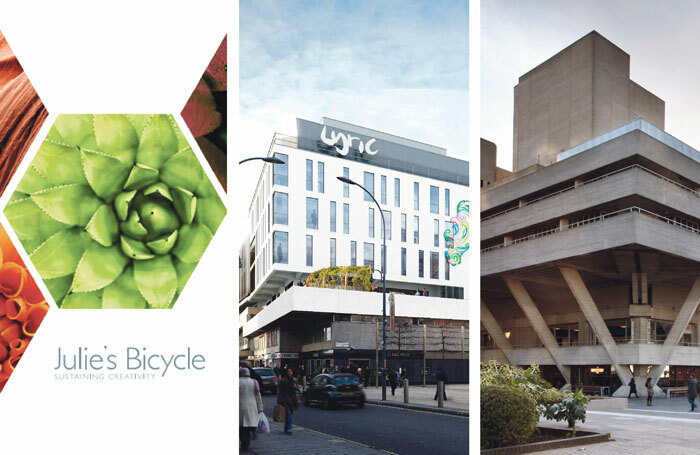 The Lyric Hammersmith ’s commitment to sustainability has seen it become one of the most engaged theatres for tracking and reducing its carbon emissions, which it has been carrying out for nine years. This year it became the first theatre to be awarded a five-star rating – the highest possible – by Julie’s Bicycle. It is only the second arts organisation to be given this award. Among the achievements that earned it such a certification were a reduction in its energy use and emissions by 50% since 2015, becoming a zero waste-to-landfill venue and installing a low energy lighting grid as part of its recent auditorium refurbishment. It also installed three beehives on its roof, in partnership with the local business improvement district. Earlier this year, the Lyric also ran the #PlasticFreeLyric campaign  – a four-week project to cut down on single-use plastics. This included themed weeks and talks to encourage staff to change habits around coffee cups, plastic bags and plastic lunch containers. The theatre has also removed all single-use plastic bottles from its cafe and bar as a result. The Lyric’s sustained work on its environmental impact is consistently impressive, but this year’s Julie’s Bicycle rating marks it out as an industry leader in this area. The #PlasticFreeLyric campaign, which received support from David Attenborough as well as major research bodies, was a highly visible and commendable project, propelling an important message to the wider sector. As the country’s flagship theatre, the National Theatre  is rightly expected to lead from the top across many fields, and its work around sustainability has stepped up a gear in the past year, both in scope and ambition. This has ranged from hitting its target to recycle 75% of commercial waste two years ahead of schedule, to implementing changes around how ingredients are sourced at its restaurants, and increasing the number of vegan and vegetarian dishes. The toilets and heating for the Dorfman and Max Rayne Centre now run entirely off waste water, and a four-year project to upgrade the house lights in the Olivier and Lyttelton means they now have custom LED fittings. The NT’s efforts have until recently centred largely around physical changes – reusing and recycling production materials and enhancing the energy efficiency of its South Bank home. However, it has also recently launched a renewed environmental strategy aimed at changing the behaviour of its staff and audiences. This was been developed with environmental arts agency Julie’s Bicycle, and includes attempts to embed environmental thinking into all activity from marketing materials to programming, as well as to the on-site services it offers.